Well, this IS about violets.... but these are all violets of the Viola sort of one genus or another. 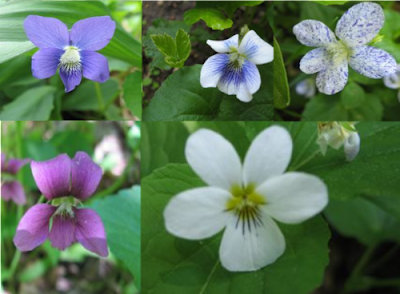 The all white one is most likely Viola canadensis, the speckled one is Viola sororia "Freckles", the regualr blue violets that grow all over everyone's yard are probably Viola papilionacea which are native and quite variable in color. All five of these have been spring visitors in my yard for over twenty years! I must be in the minority but I love the wild violets, they make great ground cover under the rather dense trees in the back yard, and if you don't mind them in the lawn... they are easy to mow and stay green all season. I'm looking for a yellow variety, and hopefully I'll get a hold of one this year. Does anyone else have any of the other Minnesota natives or other color forms of the violets? Bird's Foot violets are especially cool in the foliage department! Send in a photo! OH BOY!! Perry is Opening!! !